"Jews have been present in Delaware since the 1650's." It wasn't until the late 19th century that the Jewish community grew large enough to maintain and establish the first permanent house of worship, Wilmington, Delaware, Ohabe Shalom - Lovers of Peace (1880). 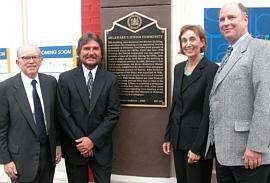 The plaque dedication program was directed by the Delaware Jewish Historical Society. Representatives of the Governor, Mayor, U.S. Senate, Congress, State government and ecumenical community attended. This building, once known as the Morrow Building, symbolizes the founding of an organized Jewish community in Delaware. Jews have been present in Delaware since the 1650's. Unitl the late 19th Century, the Jewish community was too small to maintain a house of worship. During the 1870's Jews began to gather on the third floor of this building to conduct religious services. In 1880, Delaware's first Jewish organization, the Moses Montefiore Mutual Aide Society, established the state's first synagogue, Ohabe Shalom ( Lovers of Peace). Adas Kodesch (Congregation of the Holy) was organized in 1885, becoming the first state - chartered Jewish congregation. Both Ohabe Shalom and Adas Kodesch continued to hold services from time to time in the Morrow Building. Efforts to establish a permanent house of worship bore fruit in 1898, when Adas Kodesch dedicated a building then standing at 6th and French Streets as the first structure in Delaware for use exclusively as a synagogue.